What: The Milk Urban Slide is definitely worth a stop at Montréal en Lumière. The slide is 110 metres long and filled with sound effects and flashing, multicolored lights. 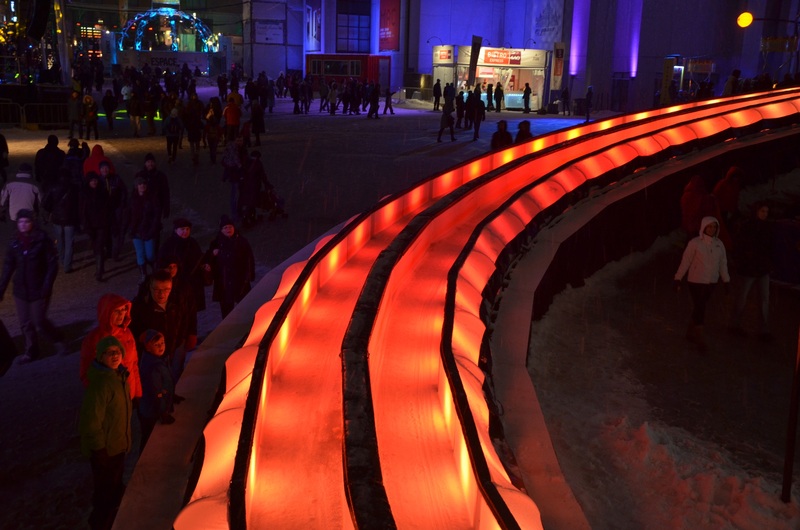 You are given a red sled on which to slide and many of the lights are activated as the sliders pass by, making the experience interactive. Two people slide at a time, so make sure to bring a partner to race with. The Milk Urban Slide is at Place des Arts. Photo by Madelayne Hajek. The only slight annoyance about this event is the lineup. It takes about half an hour to get to the slide, but with all of the live music and activities going on around you, time flies by. There is also a free photo station where you can stage a photo of you and a friend sliding and have the photo sent to you by email or through Facebook. This is an amazing event for all ages. The slide is fast enough to be thrilling, but not so fast that it will scare children. There are also walls on both sides of the slide, so it is perfectly safe. If you decide to go, make sure to bring a hat – and especially gloves – as it can get chilly while waiting in line, and you’re going to want gloves for holding onto the sled. Where and When: The slide is located in the Esplanade de la Place des Arts. The lineup for the slide, as well as the free photo station, begins outside of the Complexe Desjardins on Ste-Catherine St. This event is open until March 3, but will be closed on Feb. 26 and 27. The slide is usually open from 5 p.m. to 11 p.m. and will be open from noon to 6 p.m. on Sundays. What: The subtle difference between just playing and feeling Argentine Tango are perfectly packaged into one show — Cabaret Clandestin. Montréal en Lumière brought together a talented group of emerging artists that will warm the winter nights from Feb 21 to 24. Written and directed by Julie-Anne Ranger-Beauregard, Cabaret Clandestin takes place in Buenos Aires in 1888. The audience is immediately emerged in the narrative in what appears to be an underground saloon. The audience sits around the round tables and sips on a free drink while the performers prepare themselves. The limited space creates a warm and inviting atmosphere; small enough that even those seated in the back can see Osvaldo Rabuñal pluck the strings of his guitar, Pablo Seib tap the back of his contrabass, and the dancers lift and hook their legs around each other. But you may want to close your eyes and merely listen to Andrée-Anne Tremblay’s dazzling artistry on the violin. “Tango is a sad thought that is danced. So we dance,” says comedienne Kim Despatis. Ranger-Beauregard’s text becomes a work of poetry about a world where beauty and the malignant walk hand-in-hand. Despatis blends and interacts with the members of the audience, making us all laugh and ponder. Anglophones, don’t be discouraged. The musical theatre may be in French, but the dancing and the music in between serve as a translation that is sure to entice and enthral all. This collaborative performance weaves through a wide range of emotions in a matter of moments. From pain to passion, torment to bliss, as one would expect from tango. Where and When: The ARTV Studio underground in front of the Salon Urbain. What: Images of Buenos Aires captures the sights, sounds and smells of an incredibly rich and multifaceted city. Taking you on a journey through images, the photographs give an alternate view to what tourists pass by. An informative exhibit, Images of Buenos Aires is an educational compliment to the Montréal en Lumière festival. Unfortunately, the atmosphere of the exhibit was stuffy and pretentious and the turnout for the exhibition paled in comparison to the other events headlining that evening. Precedence was taken by an exceptionally well done live music show that was setting up just outside of building where the Images of Buenos Aires was held. However, what made up for the atmosphere were the amazing examples of traditional Argentinean music and food which tantalized the senses. Where and When: Corner of De Bleury and Ste-Catherine St. W. Feb. 27, 26 and March 1 starting at 5 p.m. and March 2 and 3 starting at 12 p.m..
What: As part of the festival’s spotlight on Buenos Aires, free tango demonstrations are being offered to festival goers. Manuel Soto from Las Piernas Tango school introduces and demonstrates the concepts of the dance on stage, while his colleagues mingle with and encourage the crowd. You can show up with a partner, a group of friends, or alone. The atmosphere is friendly and it is easy to pair up with other participants or one of the dance teachers. “One moment it’s ‘yes I want you’ and the other it’s ‘no I don’t want you’,” says Soto. There is an elegant playfulness to the exercise. With the upper body in an intimate embrace, the lower body fluidly glides across the floor. The movements must start from the body’s centre and be felt at the gut level,” notes Soto. While techniques can be mastered by professionals, the spirit of tango is rooted in improvisation and intuition. The style was developed in the streets of Buenos Aires and it has European and African influences. With time, dancers across the world have adopted the style. “Montreal has one of the biggest tango communities outside Argentina,” says Benoit Dubois, a participant who has been learning the dance for the past two years. That community might grow bigger with the help of Soto and his colleagues. Their passion for tango is contagious. Their friendly and laid-back attitude makes beginners feel like experts. It’s not about learning technicalities, it’s about feeling a mood. When and Where: Demonstrations are being held at the RBC stage, Wednesday to Saturday at 5:30 p.m. until March 2.